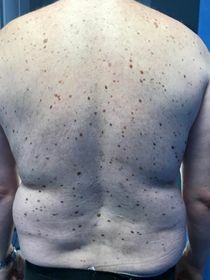 Case presentation: A 41 year old male presented to the dermatology department with multiple atypical naevi. He was diagnosed with Charcot Marie Tooth (CMT) in his twenties. He had no personal or family history of melanoma but a very strong family history of lung cancer affecting two maternal aunts and one maternal grandmother. He also has two maternal cousins with CMT. He suffers from diabetes type 2 and is on Metformin. 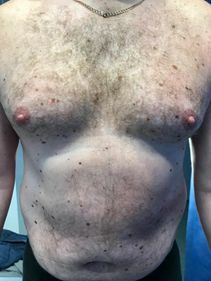 On examination, he has a florid atypical mole syndrome phenotype with multiple junctional and atypical naevi on the torso and limbs. He has muscular atrophy of the calf muscles. CMT is a neurodegenerative disease with as many as 1 in 2500 people affected (1). There has been more than 80 genes linked to CMT and many subtypes exist with dominant and recessive inheritance (2). Associations have already been made between melanoma and CMT with four previous case reports (3,4). Neural cells and melanocytes both originate from the neural crest and it is likely that shared genetic defects explain the co-existence of melanoma susceptibility and CMT (3,4). On a cellular level, melanocytes and Schwann cells possess common histopathologic and ultrastructural characteristics. Naevus cells morphologically may resemble neural crest-derived Schwann cells (5,6). The PMP22 gene has been linked to CMT and downregulation of the PMP22 gene has been found in BRAF mutated naevi (7,8). A disease susceptibility locus for familial melanoma has been reported on the 1p36 locus and one of the CMT type 2 genes is on chromosome 1, within the 1p35–p36 region (9,10,11,12). There are no previous case reports on the co-existence of the atypical mole syndrome and CMT as seen in our patient but the naevus phenotype was not described in previous publications. With melanocytes and neural cell sharing the same neural cell of origin, melanoma is likely to be found in the context of various neural disorders. Amyotrophic Lateral Sclerosis and Parkinson disease have also been reported in excess in melanoma patients and we suggest that patients with melanoma and/or the atypical mole syndrome and neural disorders should be reported into the Orphanet database (www.orphanet.net) (13,14). Manoukian S et al., Malignant melanoma and Charcot-Marie-Tooth disease: a further case. Am J Med Genet. 1997 Jan 20;68(2):242. Saini R. et al., Charcot-Marie-tooth disease and multiple malignant melanomas: a case report. J Drugs Dermatol. 2010 Feb;9(2):164-6. Jun Li et al., The PMP22 Gene and Its Related Diseases Mol Neurobiol. 2013 April ; 47(2): 673–698. Goldstein AM et al., Further evidence for a locus for cutaneous malignant melanoma-dysplastic nevus (CMM/DN) on chromosome 1p, and evidence for genetic heterogeneity. Am J Hum Genet. 1993 Mar;52(3):537-50. Smedley D. et al., Characterization of chromosome 1 abnormalities in malignant melanomas. Genes Chromosomes Cancer. 2000 May;28(1):121-5. Freedman M. et al., The association between cancer and amyotrophic lateral sclerosis Cancer Causes Control. 2013 January; 24(1): 55–60.